The company prides itself on quality, not only with its products but in every aspect of its existence. 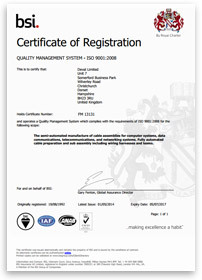 We are accredited with ISO 9001 which is regularly assessed by BSI. We are often told of the excellence of our business model and commended on our quality commitment and achievements. All our processes are controlled and records maintained for a fully traceable system. Also specific customer requirements can easily be accommodated. Before any product is released it is subject to a very stringent 100% inspection and test and if required can be supported with certificates of conformity. Our inspection department fully utilise the IPC-A-0620 criteria to ensure all products meet an internationally recognised standard. We can also include any customer specific instruction into our manufacturing and inspection processes. We all have a role to play and at Deval we take our social and environmental responsibilities very serious with a policy in place in line with aspects of ISO14001. © 2018 Deval Limited. All rights reserved.